•	Protocols: NMEA 0183 V4.0, UBX, RTCM. 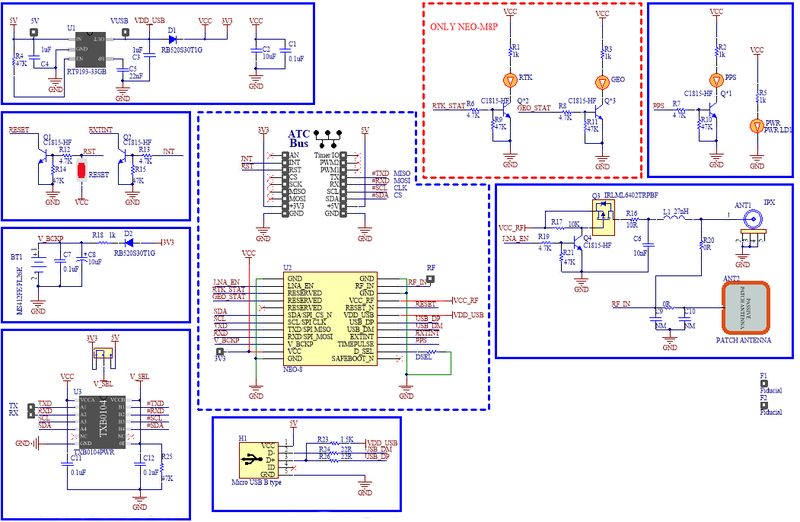 •	GPS data interface via UART, compatible 3.3V and 5V. •	Patch antenna integrate on board. •	Battery backup integrate on board. •	Led shows GPS position update, frequency: 1Hz. •	Dimension: 28 x 67.11 mm. •	Support Design Library for Altium, Eagle, Orcad. ATC-E04 Easy is a product designed by AT-COM to provide users with integrated facilities that are interconnected into a network through ATCBus. The board is powered by the Ublox NEO-8Q with features of GPS integrated in one module. Module NEO-8Q is the latest GPS series, which delivers optimum performance in GPS receiver even in harsh environments. ATC-E04-NEO-8Q is full of features to provide you with ideas for location-based applications. Power supply for ATC-E01-MC60 Easy via ATCBus at 5V and GND or 3.3V and GND. If power supply at 5V, It will then pass the power IC conversion to 3.3V supply to the NEO-8Q module. If power supply at 3.3V, It will provided directly to the NEO-8Q module. This ensures a response up to 0.3Ampe and a drop in voltage when the load does not exceed 300mV. Method 1: Press the reset button then hold for about 2 seconds, designed on the circuit. Method 2: Provide a high-level pulse to the RST pin of ATCBus Socket, module NEO-8Q will be reset. To accommodate the level of external devices when communicating with the ATC-E04 module, the board has a custom designed user interface with a 3.3V/ 5V logic voltage rating for application. When manufacturing, the voltage rating will be used at the 3.3V logic level. Remove the 0R resistor (size 0603) in the unwanted position (face is at 3.3V). Resist the 0R resistor (size 0603) to the desired position of 3.3V or 5V. Micro USB port for reading GPS data directly from NEO-8Q module and can be used for communication as an alternative to the UART. USB drivers can be down-loaded from the u-blox web site. ATC-E04-NEO-8Q has integrated Jinchang JTTD1575-1602S20P4B antenna. In addition, the ATC-E04 also has an IPX connector for the user.